a little while ago AdoreBeauty were offering a free full size bottle of Alpha-H's Vitamin C Serum or their Vitamin A Serum with purchases over $100. given that the serums are worth almost $100 each (though they're both 15% off at the moment) and also given Alpha-H's reputation i thought this was a pretty good excuse to finally pick up a few cult skincare items i've had my eye on and get an awesome freebie at the same time. i have to say my favourite of the bunch is the Liquid Gold. this product has received so much hype, if you're at all interested in skincare this will probably be one of the first products you hear about, but i'm just going to throw in my two cents and say i am completely I N L O V E. the glycolic acid exfoliates away dead skin cells overnight and my favourite part is that it's most effective if you just cleanse thoroughly and sweep some liquid gold over your face with a cotton pad and go to sleep. now, i don't drink, smoke or use drugs but i'll happily stay out with my friends until 5am on weekends so when all i want to do is go straight to sleep i'll force myself to wash my face and use a bit of liquid gold instead of my usual skincare routine and when i wake up the next day my face looks clearer and brighter that if i'd had a full nights sleep. this really is a product that delivers results from the first use and now that i've tried it i don't think i could ever be without it. the Nuxe mask is something a bit different in that it's a creamy cleansing mask. in my experience most cleansing masks are clay based, but if you've found using clay to be a bit drying or if you don't have skincare issues you're particularly trying to resolve then i think this is a great option. because it's so gentle it's the kind of mask i'll be using when i feel like treating myself as opposed to when my skin is in trouble and really needs some extra help, so if you generally have pretty clear skin or if clay masks are a bit harsh for you then i'd recommend having a look at this one. as for the Aesop masque, this is exactly what my skin needs when it is in a bit of trouble. it comes highly recommended by just about everyone i look to for skincare advice and although it's not cheap it really does work to draw out impurities and generally decongest the skin. this is my first purchase from Aesop and it's definitely got me interested in trying out some more products from their range. Desperately want to try the Liquid Gold. I've heard so many people rave about it! Ooh you got some nice stuff! The Liquid Gold sounds really good, I find glycolic acid works well for me, but I've recently started taking medication which means my skin is a bit too sensitive for it. Keeping it in mind for when I'm off it though! Oh wow, I haven't actually heard of none of them, but liquid gold sounds so good! It all looks pretty expensive, but if it works... Thanks for the recommendation! Aww man, I really want the liquid gold but I am really struggling with the price tag. Everytime someone says they love it though that little voice inside my head say 'you neeeeed it!' I'm definitely going to be giving in soon! I have never heard of any of these products. But I definitely need to! How amazing is Liquid Gold?! Crazy me thought I could somehow get away with not using this for three months while I was in Sydney, but a few weeks in, I definitely noticed the difference and I started to get little breakouts, which hadn't happened in the longest time. I'm so glad to be reunited with it! One of the girls I was living with was a skincare junkie too, so she let me use her Aesop Parsley Seed Cleansing Masque, which I just fell in love with. Now that I've tried and loved it, I'm not sure whether to buy this or the REN Invisible Pores Detox Mask because I love REN masks too! I should just save myself the dilemma and just buy both, haha. That Nuxe mask sounds absolutely gorgeous. A cream mask with rose petals? So dreamy! Great post! 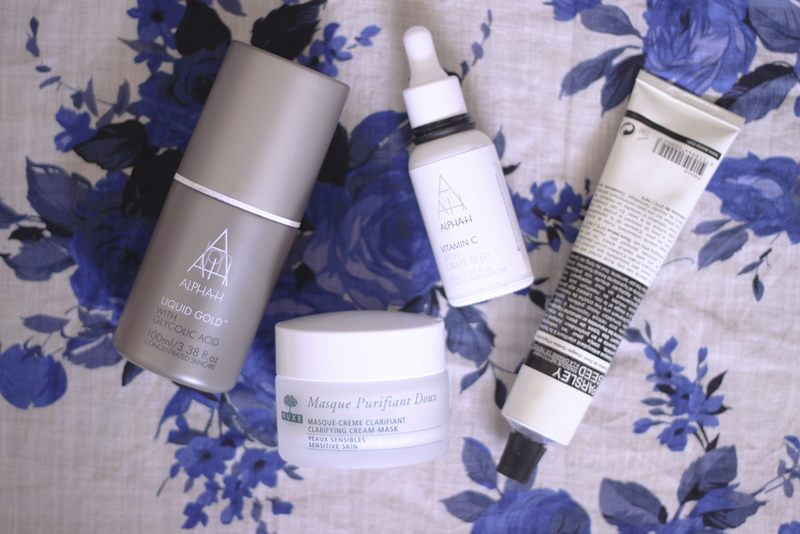 Love discovering new beauty products! Love reading about other peoples experience with skincare... as it's my job, I am always guineapiggy around on myself too! I have acutally never tried the liquid gold myself though.